City on the Edge, 2012. Oil on wood panel, 60 x 60 inches. City of the Sun, 2012. Oil on wood panel, 20 x 20 inches. Oil on wood panel, 16 x 20 inches. Agony in the Garden, 2012. Oil on wood panel, 36 x 36 inches. Oil on wood panel, 16 x 20 in. Constructing Paradise no. 1, 2012. Constructing Paradise no. 2, 2012. Constructing Paradise no. 3, 2012. Oil on wood panel, 24 x 30 inches. Oil on wood panel, 60 x 36 inches. Oil on wood panel, 40 x 44 inches. Oil on wood panel, 60 x 48 inches. 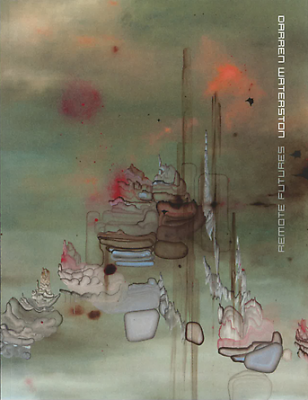 DC Moore Gallery is pleased to present its first exhibition by Darren Waterston, Remote Futures. This recent body of work explores the allure and menace of utopian fantasy, where an imagined, idealized paradise holds within it a disconcerting future. Waterston has often engaged with mythological, theological, and natural histories while proposing visual depictions of the ineffable that transcend the picture plane. In Remote Futures, there is evidence of human life in the fragments of architecture—temples, cathedrals, ziggurats, bridges—that emerge from the organic detritus. These scenes evoke places of refuge, offering an escape from the processes of time and mortality. For Waterston, however, utopian potential is untenable as such. With abstracted elements that are both corporeal and celestial, Waterston’s scenes become simultaneously Edenic and dystopian. Waterston’s formal approach complements his thematic interest in divergence. His painterly technique is drawn from both the Italian Renaissance—he layers oils and viscous glazes over gessoed wood panels—and traditional Japanese painting methods such as calligraphic brushwork. These moments of technical precision, however, are no sooner perceived than they are obscured. The resulting ethereal visions evoke both distant pasts and fantastical futures. Darren Waterston lives and works in New York, NY. His work is featured in permanent collections including Los Angeles County Museum of Art, CA; Seattle Art Museum, WA; and Museum of Fine Arts, Houston, TX. Waterston’s upcoming projects include an editioned, large-format print portfolio commissioned by the Fine Arts Museums of San Francisco, to be published in conjunction with an exhibition in May 2013. MASS MoCA will also host a major installation by Waterston in the fall of 2013.